Guest blog entry from Sue and Sheila aboard Nimrod from Saturday 5th – Saturday 12th August 2017 in Croatia. After a relaxing but very hot week in a villa in Premantura near Pula, northern Croatia we joined Nimmie and the girls expecting more of the same!! How wrong we were! 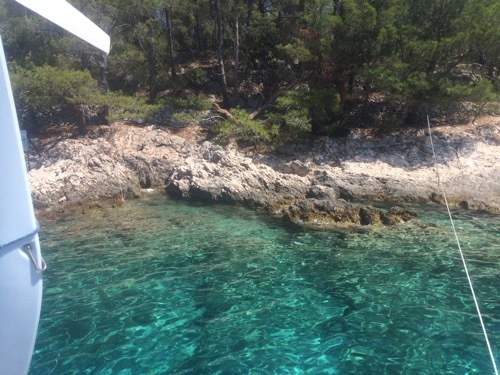 We left Veruda Marina near Pula and headed down to a small bay at Portic, which is part of the Kamenjak National Park. Jo and Liz had already moored there before, knew it was pretty and had a good beach bar! More importantly it was sheltered from the wind forecasted to blow up during the night. Lovely and peaceful, good secure anchorage and settling down to a quiet night!! Wrong again – first one chartered party boat arrived, then another, then another, then another – could they anchor like Jo and Liz? No! The night was incredibly hot, too hot to sleep, but not much chance of sleep anyway – music and karaoke til 2am and boats around us dragging anchors and moving around. Crazy Sail they were called – say no more! Chaos all around us, but nothing compared to the next night!! Sunday we had hoped to sail to the island of Cres to meet up with some friends who were part of the previous week’s villa party but the predicted storms and Bora wind meant we had to get much further south to Otok Losinj and to an anchorage in a sheltered bay, called Luka Krivica – very pretty. The sea was quite rough and it was windy – we had a lovely sail with both the main (3 reefs) and Genoa up. We took an hour to make sure we were secure – with teamwork on the helm, the anchor and swimming to take lines to shore (now an apocryphal story that Sheila swam to shore with the ropes between her teeth!). Lots of comments from Jo on the amount of anchor line others had out – far too little, but maybe Liz had been a bit over the top with 50 metres! Thank goodness we did have 50 metres and took an hour sorting it out. We booked a local restaurant in the next cove Luka Balvanida and set off via dingy and walking, hoping to meet the Cres gang! Two of them, Dozy and Carole, attempted to get there by road and track, but had to turn back – it was too steep and rough and sensibly they realised that it would be impossible to do later in the dark. Poor things they got back to Cres very late not having had dinner!! We got back to Nimmie and had just settled down to sleep – some on deck and some below (it was still so hot!) when the electrical storm started, very spectacular sheet lightning and soon the predicted gusting wind started up. We watched the lines to shore anxiously as the gusts went up to 25 knots, then 30 knots, then 35 and hitting 40 knots. But thankfully all held! Not so for those around us – we can only describe it as carnage! Many boats gave up as as anchors dragged and they motored further out in the cove, some tried to re anchor and one boat (‘next door but one’) ran aground on the rocky shore. It was a very hectic night! The wind and lightning eventually receded and next morning was lovely – calm and sunny! Breakfast versus the wasps – the wasps won and we decided to move on, but not before Jo went diving to retrieve the mask and snorkel dropped by Sheila the day before and also to look at the keel with a view to giving it a clean. A tense 20 minutes for all bar Jo, as a number of boats came in to the cove and Sue and Sheila struggled to maintain the role of indicators of ‘diver below’ (normally carried out by orange inflatables attached to the diver!) 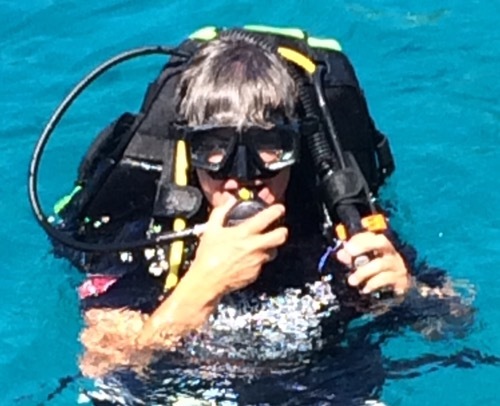 The mask and snorkel from the bottom of the cove (6 metres) were retrieved and Liz’s adrenalin levels eventually subsided!! An orange inflatable was purchased next day!! Jo about to retrieve the lost snorkel! Monday we ‘back tracked’ and moored at the town quay of Mali Losinj. 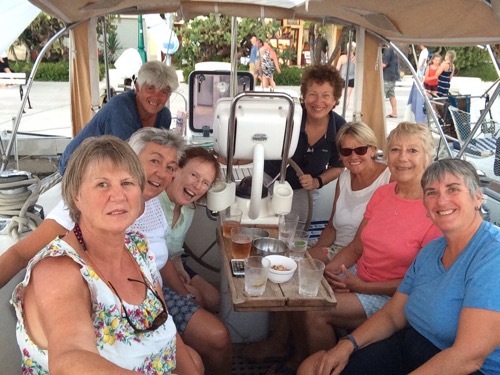 We had been unable to get a berth there the previous night, but were keen to meet up with some friends from the villa party who were staying on Cres – Caroline, Val, Dozy and Carole. Mali Losinj is a lovely harbour town with very pretty painted buildings, a few shops and plenty of cafes and restaurants. We met up with all the friends staying on Cres – first for a welcome beer, they happened to be having lunch at a bar just saying wouldn’t it be amazing if Nimmie sailed in, right in front of them – and we didn’t disappoint- and then for a great fish meal on the other side of the harbour, after pre dinner drinks aboard Nimmie. All of it well worth the diversion from our route! So continuing our journey south on Tuesday we left Mali Losinj after breakfast out at a cafe and headed towards the islands of Molat and Ist, hoping to pick up a mooring buoy. It was a long way and with the wind almost head on we motor sailed with the main up and didn’t arrive until 7pm. Not surprisingly no mooring buoys left. So we anchored at Siroka on Otok Ist. It was a stunningly beautiful evening and a very pretty anchorage and we ate on board, watching the copper moon rise. 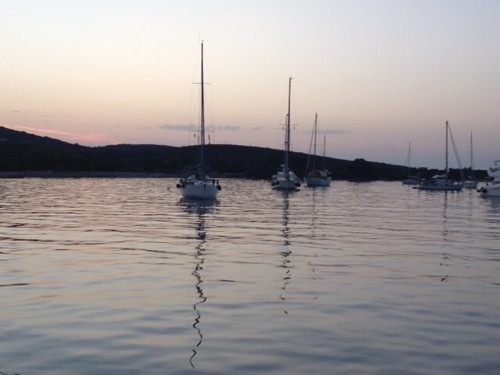 Wednesday we motored to Dugi Otok and picked up a mooring buoy at Veli Rat. Tried to take out the kayaks but it was too rough, so we walked to town hoping to cut across the island to Sakuran Beach, but gave up on that too and had a beer!! Jo and Liz took the dingy to the lighthouse and walked to the top – stunning views! It’s a lighthouse that you can stay in and Sue and Sheila had almost booked it, except that it is not very accessible by ferry. Part of the reason for going there was to see it! Thursday – we motored to the beach at Sakuran, passing the Veli Rat lighthouse. Beautiful azure waters, great snorkelling, lots of fish. Took both kayaks to beach to check out if it really was sand as stated (one of top ten sandy beaches in Croatia) and to visit the beach bar. Yes there is a narrow strip of sand, but like many beaches in Croatia the light coloured pebbles make the water look stunning. The kayak trip back to the boat was challenging as the wind and waves had really picked up. 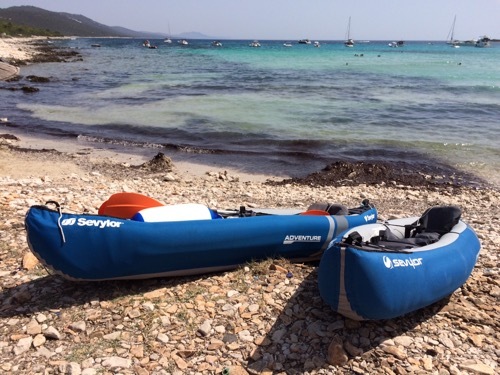 We then continued to our next stop on the northwest side of Otok Ugljan, which we hoped would be sheltered from the predicted storms coming in the evening and the swell. We were enjoying a pleasant sail with the wind behind us and the Genoa up, when the storm started up EARLY(!) It looked really spectacular moving round the island – dark clouds, orange sky but with gusting winds up to 35 knots, all a bit hectic for us two novices! 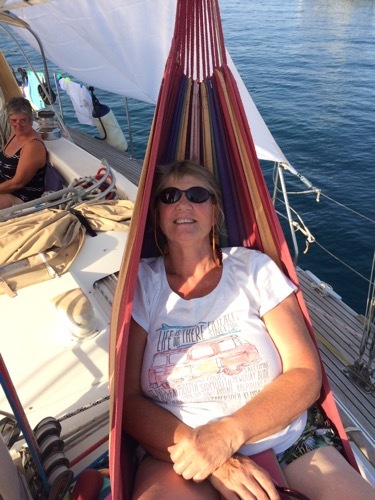 Gunwhales in the water – Sheila attempting to helm! Jo and Liz remained calm and got us safely to our anchorage at Uvala Pavlesina for the night. 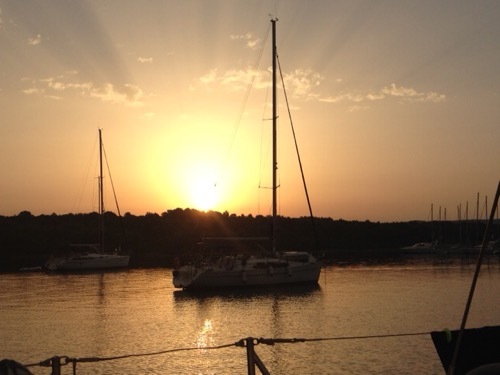 It is now Friday – we can’t believe our week has gone so fast and we are now in our final berth (not forever we hope) which is near Zadar from where Sue and Sheila will go by land to Split. It has been a fantastic week – a huge thank you to Jo, Liz and wonderful Nimmie, who have given us so many varied experiences of the sea and sailing in a very short space of time. We have learned a great deal, have seen parts of Croatia we could never have got to, taken hundreds of photos, swam and snorkelled every day in beautiful clear waters, eaten some great meals and best of all spent a week with Jo and Liz. Thank you and lots of love from the vaguely competent crew and part time galley slaves!